The wood and pellet stoves are the ideal solution for those who have a lot of firewood but still want the convenience of pellets. The pellet stoves and wood combined can heat your radiators or your floor system using both the pellet, even when you are not at home or in the wood logs. They can also produce domestic hot water, either directly or combined with appropriate boiler or puffer. hot water for an entire family. E 'equipped with an exclusive system "SAFE top", appreciated for over 10 years throughout Europa.Grazie to this system, designed and developed by KLOVER, Bi-Fire can be installed on any type of plumbing and boiler combined with any , also type gas outlet. If necessary can function as the sole source of heating, without the need for additional hydraulic components on the system, since it has already been installed throughout the series. The choice made by our designers to produce a machine with two combustion chambers side by side is undoubtedly the solution that offers the best results in terms of performance, fuel economy and ease of use. Price refers to the version tiled / steel. 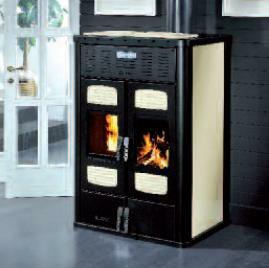 the pellets when the wood finishes, pellet and wood at the same time, pellet ignition programmed). The choice made by our designers to create two combustion chambers side by side is undoubtedly the solution that offers the best results in terms of performance, fuel economy and ease of use. mid, innovative solution that simplifies installation.